According to the Associated Press, that inspection was actually an employment audit. The agents verified that the cashier had a valid green card and gave the owner three days to produce hiring records that show the immigration status of the store’s employees. The same action was taken at about 100 other 7-Eleven stores in 17 states and the District of Columbia the same day, in what officials are calling the largest immigration action against an employer under Donald Trump’s presidency. 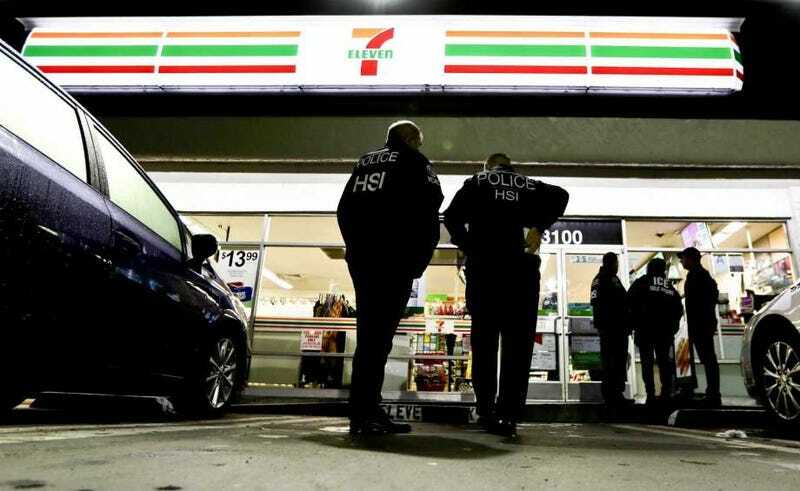 Twenty-one 7-Eleven workers across the country were arrested on suspicion of being in the country illegally. Bennett said that after the investigation, officials will look at whether the cases will warrant administrative action or criminal investigations. 7-Eleven Stores Inc. is an Irving, Texas-based chain that has more than 8,600 stores across the country. In a statement, the company said that franchise owners are responsible for hiring and for verifying work eligibility. The company has previously ended franchise agreements when owners have been convicted of breaking employment laws. Wednesday’s audits arose from a 2013 investigation that resulted in charges against nine 7-Eleven franchisees and managers in New York and Virginia. Eight have pleaded guilty and were ordered to pay more than $2.6 million in back wages, and the ninth was arrested in November. The managers used more than 25 stolen identities to employ at least 115 people in the country illegally, knowing they could pay below minimum wage, according to court documents. Neither 7-Eleven nor was its parent company, Seven & I Holding Co. based in Tokyo, was charged in the case. Although employers are rarely prosecuted in these cases, Mark Krikorian, who is director of the Center for Immigration Studies, told AP that the inspections offered “a good sign” that the administration was serious about going after employers. But, Krikorian said, the administration would need to go beyond audits.